“You and me and me and you, a play-date for two friends so true! T’s friend T2 and her mom Wecki came over for a playdate last Saturday! Our girls are only days apart in age, and I just love to get them together. Puff adores T2, and asks if we can go play with her quite frequently . . .which is kind of funny, because they never really seem to play with each-other when they’re together. I suppose it’s the age, but whatever it is, and however they play, T is crazy for her little friend. 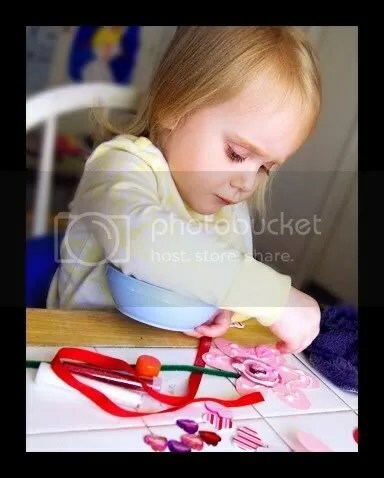 The idea that us goofy moms came up with was that we would have an arts n’ crafts play-date – which is something new and fun that we’ve never tried before. 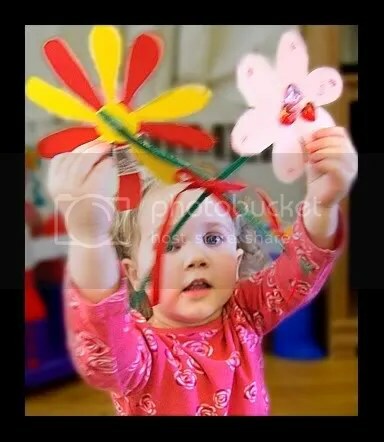 We decided that we would help the girls to make glittery Valentine’s flowers (if they chose to cooperate). Not for long, anyway. . .which I was kind of expecting, considering that they’re both SO two! They did have fun playing together in their weird not-together kind of way. The kitchen set was the major focal-point of the morning (naturally, cuz’ it rocks), and their method of play involved bringing every item that lives in the kitchen set over to one of us mommy-types. Toddlers are so weird! They never will cease to make me giggle with their random behaviour, but as long as they’re happy (which they were) and cleaned up after they were done unloading the kitchen (which they did) I have no complaints. I love every minute! We did eventually convince them to give the craft a try. THAT Lasted for about 15-ish minutes before they were done. In retrospect, I think that they were too preoccupied by the fact that not quite everything had been unloaded from the oven and refrigerator yet, and they were in a rush to get back to it! 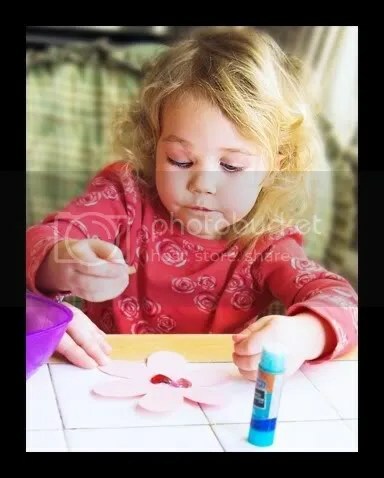 We all know how much the Puff loves her arts n’ crafts, and sure enough, when she woke from her afternoon nap she declared that she wanted to make Valentine flowers – and she was at it for nearly an hour! Of course, I had one of those nights the evening before where I had gotten all involved in something and stayed up waaaay past my bedtime (I think it was somewhere around 4am when I went to bed). So naturally, T just HAD to get up earlier than usual, at 6 am, just to spite me. I was tired, not thinking clearly, and didn’t get even ONE picture of the girls playing together! I’m so mad about it! Actually, I only took about 6 pictures the whole morning – and those who know how trigger-happy my camera fingers generally are will understand how exhausted I was. . .
Me n’ T have done these several times before, but they’re so much fun, we will DEFINITELY be doing them again. In the past, I’ve had T actually paint the paper that we use, this time we used some pretty scrap booking paper that was on sale for next to nothing. 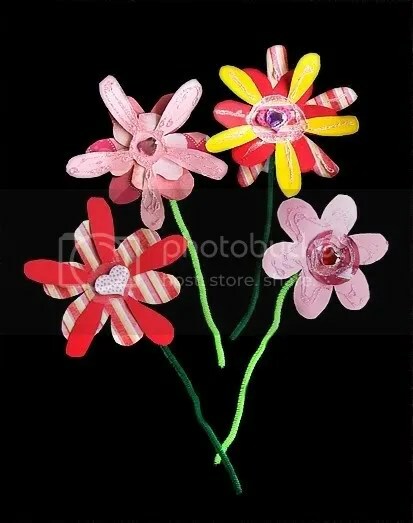 All you hafta do is cut out several types and sizes of flowery shapes, along with circles and/or hearts for centers. These can be made out of paper, felt, fabric, even tulle will work! 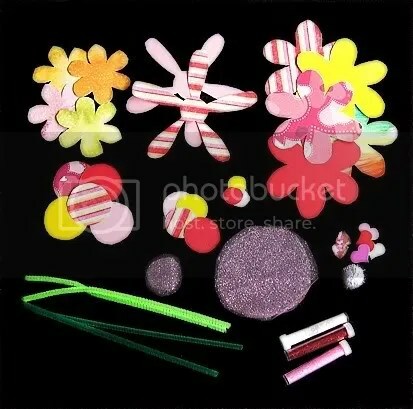 You’ll also need pipe cleaners for stems (these are easiest to hot-glue in my experience), and possibly some glitter. Give the kid a glue stick and turn ’em loose. You’ll be surprised at all the pretty combinations they’ll come up with! Very sweet!! It was nice to see some pictures of T2, also! Such pretty hair! I’m glad the girls were happy and had fun, even if they didn’t cooperate with the crafts. heh…Sorry you were so exhausted, though I know it was not MY fault this time. hahaha… I loved the flowers…but turn them loose?! Are you crazy?! My kids would glue everything they could if I were to hand them a glue stick and turn them loose. In fact, they’ve glued my table, the floor, and their chairs all while I was RIGHT there. hmph. Turn them loose…yeah right! And to think Tori seemed not so interested, but requested flowers and playing with T-ball not even 24 hours later. Just so much “new” stuff. 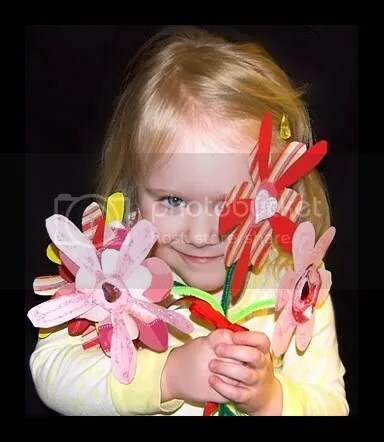 After the crafts we’ve been trying to do at home, maybe the flowers would go over better again. We’ll have to work on those here…see how it goes for her this time. I know she loved being there (and the inspiration that has occured because of it). Thanks again for the day. We will have to do it again (and when it’s warm, maybe you call can come down here for some outdoor fun…since they’ll tire before getting to any dangerous areas…new mommies won’t have to watch the 3 yr olds too closely). I absolutely love seeing pictures of those two girls getting together. I miss seeing Miss. Tori! Its funny how 2 year olds interact. I get a kick out of it! If nothing less you get some mommy and mommy time!